The new law requires motor vehicle operators to reduce their speed and change lanes when approaching authorized vehicles displaying emergency lights. Such vehicles include police, fire and medical services vehicles, and also highway maintenance, tow trucks and official motorist aid vehicles displaying amber emergency lights. 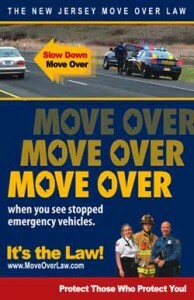 Where possible, drivers are required to move over to create an empty lane next to the emergency vehicle. When safely changing lanes is not possible, drivers must slow down below the posted speed limit prior to passing emergency vehicles. Drivers should also be prepared to stop, if necessary. Fines for violating this law run from $100 to $500 and will be determined by the municipal court in which the violator is charged.